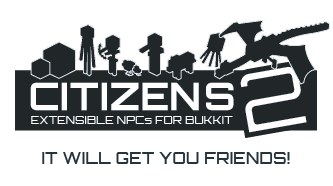 Citizens is the original Bukkit NPC plugin, adding everything from simple NPCs that talk to lively, active Denizens, Sentries, Traders and more. Citizens contains a variety of toggleable characters and unlimited possibilities for expansion with the new easy to use API. With advanced features such as scripting, AI and a helpful dev team, Citizens will continue to expand to make your server even better! For more information and all the gory details, see the wiki documentation and links down below. Basic NPCs - right click messages, items, looking around, waypoints, and much more. Compatible with Essentials Eco, BOSEconomy, MultiCurrency, and iConomy 4, 5, & 6 through the use of the Vault plugin (required). Make sure the issue is not already listed in the Issue Tracker section. Make sure the Citizens Wiki doesn't already have information on your issue. Come to IRC on EsperNet #citizens for any questions you may have. Yes, we know that this is a pretty major change. Yes, things may break. Yes, not all of the features from 1.2 are re-implemented. But, with the rewrite, new API and new features we hope to have a sustainable base for server owners and developers alike. You can download Citizens here. Look above for a link to dev builds.